What's the name of that star? Where's Saturn? Get the answers from mySKY--a fun new astronomy helper from Meade. SPACE STATION MOVIE: To the naked eye, the International Space Station (ISS) gliding across the night sky appears as a bright point of light. If you turn a backyard telescope on that point, however, it resolves into a sprawling space complex almost as wide as a football field. Ralf Vandebergh of the Netherlands made this movie of the view through his 10-inch telescope on April 19th. Anyone can see the ISS this way; the trick is knowing when to look. MAGNETIC EMERGENCE: Sunspot 955 is growing rapidly. Only two days ago it was nearly invisible; now the dark region is larger than Earth. SOHO magnetogram: May 7-10, 2007. In the movie, white denotes magnetic north (N) and black denotes magnetic south (S). Sunspot 955, like all magnets, has two poles, except unlike the magnets on your refrigerator, the poles of sunspot 955 are the size of planets. These magnetic fields are so intense, they block the flow of heat from the sun below, causing the area to cool and darken--hence the sunspot. The dark core of sunspot 955 is spreading. If you have a solar telescope, take a look. 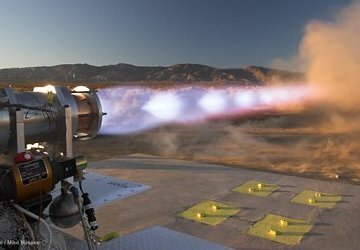 SHOCK DIAMONDS: Recently, NASA engineers tested a revolutionary methane-powered rocket engine. Blue flames lanced across the Mojave desert, possibly heralding a new kind of spacecraft that could roam the outer solar system, gathering fuel from planets and moons it visits: full story. Many readers who've seen the movie want to know, what are those white shapes in the exhaust? Answer: Shock diamonds. Also known as Mach disks, they are interference patterns formed by shock waves propagating down the engine's exhaust plume. Shock diamonds are formed when exhaust exits a nozzle supersonically and at a pressure different than that of the ambient atmosphere. The most famous photo of shock diamonds shows Chuck Yeager's X-1 rocket plane just moments after he first reached Mach 1 on Oct. 14, 1947.